Kafie 1901 San Andres debuted in 2016 as the company's final blend (due to concerns over the impending FDA regulations at the time). As such, Kafie 1901 saved the best for last, laboring over the blend for over two years, making the Kafie 1901 San Andres the pinnacle blend in the company's entire portfolio. 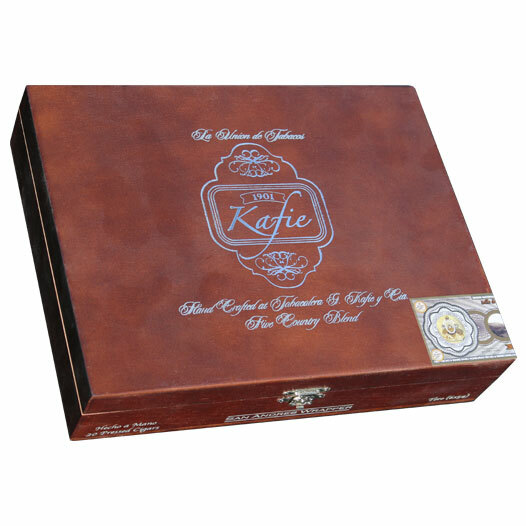 The cigars were introduced in commemoration of Kafie 1901 Cigars' fifth anniversary, using a diverse blend from five countries. For starters, tobaccos of three countries have been selected for the filler blend, including ligero from Nicaragua, Brazilian mata fina, and Dominican Piloto Cubano. This blend is bound in a proprietary Honduran binder and finalized in the cigar's namesake Mexican San Andrés maduro wrapper. The final cigars are then box-pressed, allowing the wide range of tobaccos to marry and mature. Enthusiasts can expect a medium to full body, showing full flavors of earth, leather, zesty pepper, brown sugar sweetness, and molasses.